"I guess it's true what they say: No matter how powerful you are, there's always someone bigger and stronger than you. I just never thought it applied to me." 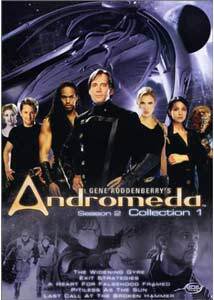 The first season of Andromeda was, I can easily say, an underwhelming affair. The show is sold as "Gene Roddenberry's Andromeda," but the only sense I got of the Great Bird of the Galaxy's legendary rose-colored social prognostication was in the overarching premise of heroic captain Dylan Hunt's attempts to re-establish a unified, universal government. Since the show was constructed from notes the creator scrawled on cocktail napkins and stuck in a drawer, that's probably all there was to his vision. What actually made it to the screen was far less lofty, a show less about ideas than about shoddily constructed, gratuitous action scenes. Yet I didn't hate the show, mindless plots and clich�d ideas notwithstanding, because I enjoyed the cast and the occasional flashes of ironic dialogue and humor. Luckily, those elements continue with the first installment of Season Two, and a few other elements improve as well (for instance, characters finally seem to be affected by what happens from episode to episode�something even Star Trek: The Next Generation struggled with). All of your favorites are back, including bubbly, mysterious Trance (Laura Bertram); female Han Solo, Beka (Lisa Ryder); Worf clone Tyr (Keith Hamilton Cobb); and loony Harper (Gordon Michael-Woolvett). Oh, and Rev Bem (Brent Stait) is back to, but he's nobody's favorite. This two-disc set includes the first five of Season Two's 22 installments. This episode picks up where the first season cliffhanger ended, with half the crew dead and the rest in severe trouble. Don't worry, though, because within the first ten minutes, the reboot switch is flicked, and everyone is alive and well. Except, of course, for Tyr and Harper, who have been kidnapped and taken to the World Ship, a massive structure filled with trillions of carnivorous Magog, led by the mysterious Shadow Being that popped up here and there in Season One. There is far to much of your typical Andromeda "action" (translation: sparks flying... in slo-mo! ), but there is some nice character continuity as well, as spiritual being Rev Bem deals with his darker Magog nature. The special effects of the World Ship are nice, and the ending finally gives Dylan a bit of motivation to get the ball rolling on that whole "re-establishing the Commonwealth" idea that gets a vague mention in every third episode. The premiere earns 3 Andromedas out of 5. Dylan: Tyr, any ideas that might change their minds about killing us? Dylan and Co. crash land the Eureka Maru on a strange, frigid world that looks nothing like the wilds of snowy Canada. The ship falls into a mine shaft, and as Dylan and Beka try to free it, Tyr faces off against some Nietzchians he once betrayed who aren't too happy he has turned up again. Geez, does Tyr know every Nietzchian in the universe? The icy change of scenery is nice, and though the action on planet is routine, there is more nice character work, as Harper, on the Andromeda, deals with the knowledge that he has a nest of Magog growing in his stomach following the events of the season premiere. The crew visits a truly alien world... Canada. 3 Andromedas. Harper: Just do it like we practiced. Trance: When we practiced we messed up. This half-baked heist episode is totally derivative, but as an homage to caper films like Ocean's 11, it works pretty well. In order to stop a war between two potential Commonwealth worlds, Dylan has Beka and the crew of the Maru rob a museum to steal an alien artifact known as the Hegemon's Heart, a jewel that holds the key to untold treasures. Such a valuable trinket catches the eye of another as well�the museum's chief of security, a former thief who has his eyes on the prize, and on Beka. The romance between the criminals is forced, but there are some nice moments between Harper and Trance, always good for a laugh. Call it "Dylan's Four." Only 3.5 Andromedas, though. The show has been playing around with the question of the true nature of Trance since the first episode, and here, she gets an episode all her own. She's kidnapped by a Xenophobic race and questioned by The Cigarette Smoking Man (The X-Files' William B. Davis), who may not be as in control of the situation as he thinks. The subplot, with Dylan trying to broker a deal between the species who grabbed Trance and some aggressive agitators, is plodding and largely inconsequential. Trance is my favorite character, and I really wanted to like the episode, but it's all a tease. Trance messes with her questioner, and hints at her past, but everything turns out to be a big joke. Not a funny one, though. The Andromeda visits the western part of the galaxy as Dylan searches a dusty saloon (complete with swinging doors) for Isabella Ortiz, a rebel who once commanded an alliance of 20 worlds. Dylan wants her to help rebuild the Commonwealth, but he's too late�he arrives on planet to find she's already dead, though a doctor has assumed her identity to keep supplies coming to the lonely outpost town. He is just in time to clash with the Kalderans, the oppressive government that has but a bounty on Oritz's head. Too bad she's dead. Or is she? No, she is. Or is she? Watch as Dylan puzzles out the answer for 20 minutes, amid the most gratuitous action scenes the series has yet produced (flying sparks kill hundreds!). The "Old West" atmosphere is a nice idea, but the show makes little use of it, and the plot is weighed down by too many genre clich�s. Why go looking for heroes when you have Sorbo and his fabulous, Samson-esque head of hair? 2.5 Andromedas. Image Transfer Review: Andromeda airs in 4:3, but was shot with high-definition cameras; thus, we can enjoy the show on DVD in 1.78:1 anamorphic widescreen. Colors are nicely saturated, blacks are nice and deep, and shadow detail is very good. The special effects scenes show some shimmer, likely because they were mastered at a low resolution, and there is some grain here and there, but not enough to mar the presentation. Audio Transfer Review: I don't know if they got a new sound designer for Season Two, but this disc sounds a lot better than the previous volumes. Andromeda is stilled mixed in DD 2.0, but there is a much more enveloping soundfield this time, with a lot more atmosphere from the surround channels. Dialogue, score, and sound effects are mixed well across the front soundstage, with dialogue anchored in the center (though there is some bleed into the mains). If you have a receiver that supports it, the show sounds really great mixed into Pro-Logic. Extras Review: I said in my review of the last volume of Season One that I was interested in seeing what extras ADV would include once all the pre-existing text materials had been used up. The answer is, not many. The volume of features is severely reduced with this set. On the one hand, I never really read through all the pages of text on the last few discs. On the other, retail remains a rather high $39.99, and I don't know that what's here justifies that price tag. In a nice change of pace from the last two volumes, the advertised commentary track is actually included. Actress Lisa Ryder (Beka) and Season Two production designer Richard Lewis (no relation, I hope) chat through A Heart for Falsehood Framed. They strike just the right balance of technical detail and self-deprecation, making for an enjoyable listen. Ryder couldn't be more right than when she admits that sometimes the show is a bit overzealous about "embracing the camp." This volume's brief featurette is a five-minute tour of the sets conducted by Gordon Michael-Woolvett (Harper). He's funny, so the clip is funny, if a bit of a waste of time. Each disc includes a few alternate takes (for a total of five). As usual, they are mostly scene extensions and brief deleted snippets that aren't good for much except as a curiosity to fans. I continue to be moderately amused by each volume's brief blooper reel. Disc One includes some concept sketches and Disc Two a brief animatic of the new bridge design. Lots of promotional spots this time around, with one for each episode and three trumpeting the new season, and the expected ADV trailer gallery. Not much new this time, with clips for Farscape: Season 3, RahXephon, Gamera: Guardian of the Universe, Noir, Full Metal Panic, Samurai X, City Hunter .357 Magnum, and Zone of the Enders: Delores. ADV delivers another snazzy installment of Andromeda (even if there are a few less extras this time around). The series' producers, meanwhile, deliver five more episodes of this half-baked, but ultimately fairly entertaining, sci-fi "action hour." Stick it in your player, and watch the sparks fly. Literally.